Microwaves are a type of high-frequency electromagnetic wave. The microwaves that are used in a microwave oven to heat food have a wavelength of around 12.23 cm and a frequency of 2.45 gigahertz (GHz). The electromagnetic waves produce oscillating magnetic and electric fields that excite molecules inside the field, therefore generating heat. There are a couple different factors that can contribute to a less-than-satisfactory microwave heating experience. The first is that the different ingredients in a meal often have varying rates of energy absorption. One case where this is quite noticeable is in the reheating of a berry pie — the berries absorb heat much faster than the pie crust, leaving a hot pie filling with a cold exterior. This is due to the fact that foods that contain higher amounts of water tend to absorb microwave energy with a higher efficiency, while foods with lower water content absorb heat more slowly, causing uneven heating. This is due to the dipole that exists across a water molecule, which causes the negative and positive ends of the molecule to switch back and forth in the presence of the oscillating electromagnetic field. Because of this, you’ll also notice that water in a liquid state heats at a more efficient rate than ice, due to the fact that liquid molecules move more freely than the molecules in ice, generating more collisions and therefore more heat. Another reason for why microwaves heat unevenly comes from the nature of the complicated oscillating pattern that takes place inside the oven. 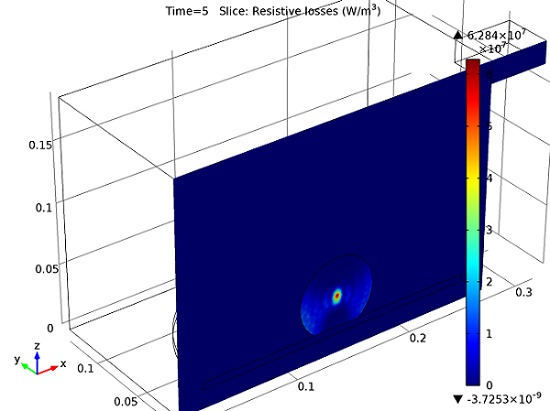 Let’s take a closer look at the physics behind the way microwaves heat food using a COMSOL simulation, where we can understand the electromagnetic field and heat transfer that takes place during the heating process. First, we can set up our microwave oven geometry. 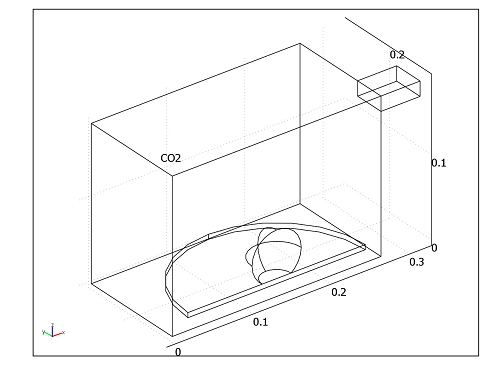 In our simulation, the microwave oven is basically a copper box connected to a 500 W, 2.45 GHz microwave source. The microwaves are then directed toward the center of the oven via a waveguide located in the top-right corner of the oven. The bottom contains the glass plate on which food is placed. To keep our analysis simple, we can look at how heating takes place in a homogeneous food, such as a potato. The geometry of the microwave, waveguide, glass plate, and potato is shown below. Because of the mirror symmetry present in the model, only half of the geometry needs to be modeled. Geometry of a microwave oven, waveguide, glass plate, and potato. The geometry is reduced due to mirror symmetry. In the simulation, a piece has been cut from the bottom of the potato in order to provide stability for the potato resting on the plate. This cut also aids in the creation of the finite element mesh, allowing for a detailed analysis to be conducted in the region where the potato comes into contact with the plate. 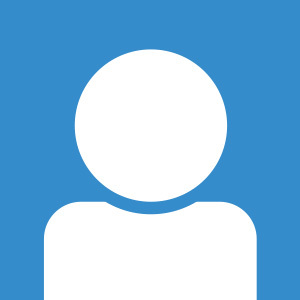 The resistive metal heat losses from the copper walls of the microwave and waveguide, although small, are also taken into account through the use of an impedance boundary condition. When we input microwave radiation into the potato, the potato acts as a resonance cavity, trapping some of the electromagnetic field inside. The power transferred into the potato, or the dissipated power, is about 60% of the power that is released from the radiation source. The rest of the power is reflected back through the port. 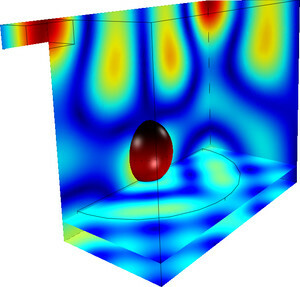 As can be seen in the simulation below, the resonance cavity creates a strong peak in the center of the potato where the dissipated power is at its highest. 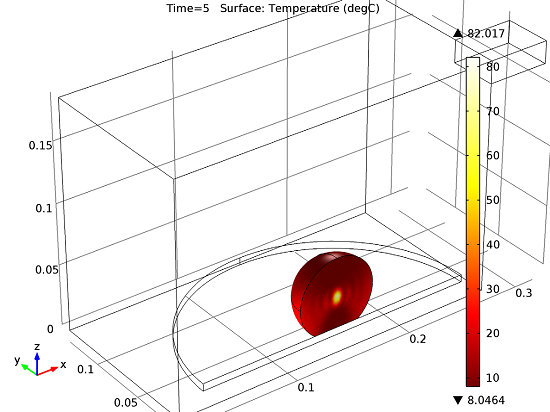 Dissipated microwave power distribution within the potato. Notice the strong peak at the potato’s center. This microwave field induces heating inside of the potato. After five seconds have passed, we can look at the amount of heat that has been generated within the potato. In the simulation, we can observe that only the center of the potato has begun to heat after five seconds. Also, due to the potato’s low thermal conductivity, the heat remains focused at the center and does not distribute. This leads to the hot center and cold exterior that we sometimes experience when heating food in a microwave. Temperature distribution in the potato after five seconds of heating. If we were to continue heating the potato for a longer period of time, the central temperature in the potato would eventually reach the boiling point, and steam would form and diffuse outwards, accelerating the heat transport and lowering the power dissipation in the center as it dries out. This will happen as the temperature nears 100°C, although the rising local pressure inside the potato may increase this boiling point. However, when superheated enough, one or several microexplosions will occur, opening up steam channels to outer parts of the potato. Anyone who has tried microwaving something like mashed potatoes or thick soup has probably experienced these microexplosions, and witnessed their aftereffects on the inside of the microwave oven. While the simulation discussed above does not include these nonlinear effects, it can serve as a good starting point for a more complex simulation that may include these and other effects. Location of the standing waves in a microwave. Rotating the glass plate located at the bottom of the microwave and placing the potato on the edge of the plate, instead of the middle, may lessen the problem of high intensity spots contributing to uneven heating. In the image above, we can see how rotation would move the food through the spots.